Refer to Figure 1 for supply power wiring. Connect supply power at header J11. Header J11 is rated at 4.0 Amps per pin. For applications requiring less than 4.0 Amps, a single pair of power and return wires should be connected to a single pair of + and – pins, respectively. For applications requiring between 4.0 and 8.0 Amps, connect two pairs of supply power and return leads to both pairs of + and – pins on J11 to handle the higher current. For three wire DC fans, TachScan-9 distributes power to the fans in addition to accepting tachometer pulses from the fans. Connect the fan wires to headers J1 through J9. Fan wires are usually color coded with red for +, black for – and white or yellow for A (alarm). Fan current at each header must not exceed 4.0 Amps. Total fan current through J11 must not exceed 8.0 Amps. TachScan-9 cannot distribute AC power to AC fans. AC fans usually have 5 wires, 2 for power and 3 for the tachometer pulse circuit. Connect the AC fan power leads to the rated source of power. Connect the tachometer pulse leads (+, -, tach pulse) to J1 through J9. TachScan-9 distributes power to run the tachometer pulse circuits within the fans. 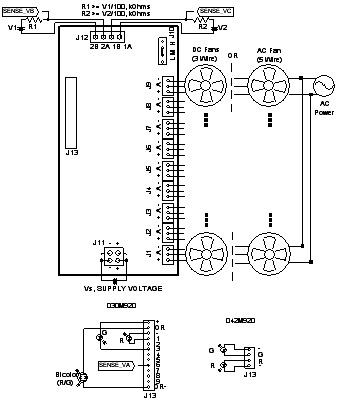 Apply a DC voltage as specified by the fan manufacturer for the tachometer pulse circuits at J11. If tachometer pulses are not connected to all of the A inputs at headers J1 through J9, TachScan-9 will indicate a fan failure. The 5-position switch at SW1 allows fan headers from J5 through J9 to be disabled. See Table 1 for switch settings. Standard TachScan-9 boards are shipped with the switches in the OFF position. Because of the wide range of power supply voltages that may be connected to J11, TachScan-9 may be used with any DC SmartFan speed controller. The power output of the speed controller that would otherwise be connected directly to the fan load is instead connected to J11 (see Figure 2). TachScan-9 in turn distributes this power to the fans. Figure 2: Multi-board configurations for variable fan speed control and tachometer alarm monitoring. When installed using ¼” spacers, all versions of the Tachscan 9 are design to withstand a maximum voltage of 3000VDC or 3000RMS during Hi-Pot testing.